With his head tilted back, his mouth open as if singing, and his arms thrown out in a dramatic gesture, the man on this vase shows the effects of a long night of drinking. Luckily, a servant-boy is there, anticipating his master's needs. The boy stands patiently carrying his master's belongings--a walking stick and a basket covered with a cloth--and holds out a vessel for him to urinate into. The jug he offers is a chous, a special form of oinochoe (wine-pitcher), and it is the very same shape as the vase on which this scene is depicted. Reinforcing the connection, another chous stands at the far right of the scene, garlanded with ivy. Shape and decoration are, therefore, neatly tied on this vase. The chous was used during the Anthesteria, a three-day religious festival in honor of Dionysos, the god of wine. A drinking contest was held on the second day of the festival, and these jugs were used to hold a standard amount of wine for the contest. Andre Emmerich Gallery (New York, New York), sold to Walter and Molly Bareiss, 1964. Walter Bareiss, American, born Germany, 1919 - 2007 and Molly Bareiss, American, 1920 - 2006 (Stamford, Connecticut), distributed to the Mary S. Bareiss 1983 Trust, 1983. André Emmerich Gallery. Masterpieces of Greek Vase Painting: 7th to 5th century B.C., exh. cat. (New York: André Emmerich Gallery, April-March 1964), no. 30, ill.
May, Helmut, ed. Weltkunst aus Privatbesitz, exh. cat. (Cologne: Druckerei J. P. Bachem, 1968), cat. no. A 35. Bothmer, Dietrich von, and J. Bean. Greek Vases and Modern Drawings from the Collection of Mr. and Mrs. Walter Bareiss. Exh. checklist, The Metropolitan Museum of Art. New York: 1969, p. 5, no. 59. Schauenburg, Konrad. "Seilenos ouron." Mitteilungen des Deutschen Archaeologischen Instituts, Roemische Abteilung 81 (1975), pp. 313-316, p. 314, n. 5. Mayo, Margaret E., and Kenneth Hamma, eds. The Art of South Italy : vases from Magna Graecia : an exhibition, exh. cat. (Richmond : Virginia Museum of Fine Arts, 1982), p. 103. True, Marion, and Jiri Frel. 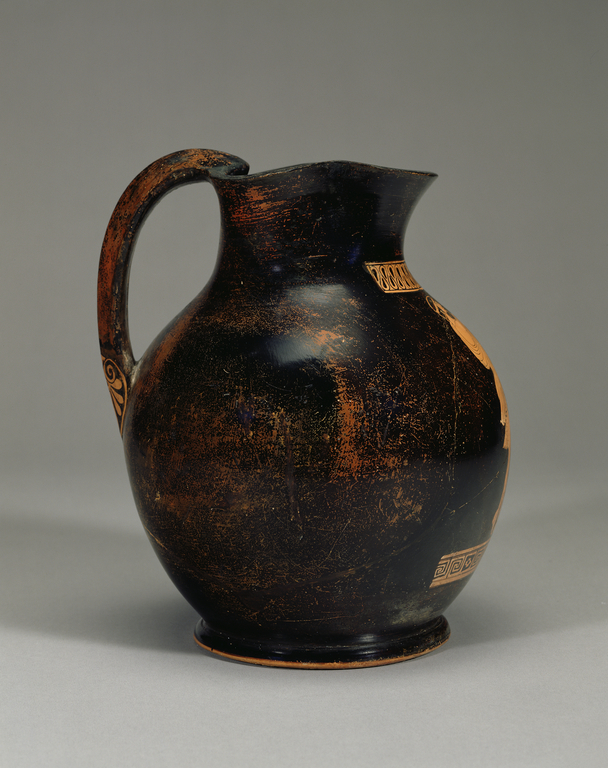 Greek Vases: Molly and Walter Bareiss Collection (Malibu: J. Paul Getty Museum, 1983), p. 54, no. 38, fig. 38; p. 77, no. 119. Knauer, Elfriede. "A Chous by the Oionokles Painter, " Greek Vases in the J. Paul Getty Museum 3. Occasional Papers on Antiquities 2 (1986), pp. 91-100, figs. a-g. "Acquisitions/1986." The J. Paul Getty Museum Journal 15 (1987), pp. 160-61, no. 7. Serbeti, Eleftheria D. "The Oionokles Painter," Boreas 12 (1989), pp. 19, 23, and 29. Hamilton, R. Choes and Anthesteria. Athenian Iconography and Ritual. Ann Arbor: 1992, p. 207, Appendix 3. Kilmer, Martin F. Greek Erotica on Red-figure Vases. (London: Duckworth & Co. Ltd., 1993), pp. 60, 63, cat. R1186. Sparkes, Brian A. The Red and the Black. Studies in Greek Pottery. London and New York: 1996, pp. 86-88; fig. III:18. Neer, Richard T. Corpus Vasorum Antiquorum. The J. Paul Getty Museum 7 (USA 32). Malibu: 1997, pp. 41-42, no. 38; fig. 16; pl. 365. Schaefer, Alfred. Unterhaltung beim griechischen Symposion. Mainz: P. von Zabern, 1997, p. 27, 3. Schreiber, Toby. Athenian Vase Construction: A Potter's Analysis (Los Angeles: J. Paul Getty Museum, 1999), pl. XVII; fig. 23.24. Clark, Andrew J. and Jasper Gaunt with Benedicte Gilman. Essays in Honour of Dietrich von Bothmer (Amsterdam: Allard Pierson Museum, 2002), pl. 22.a. 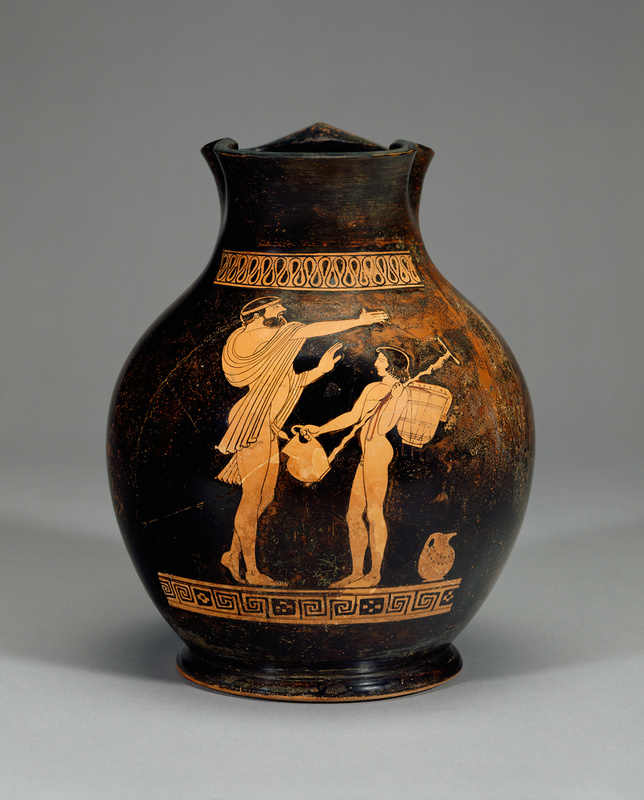 Cohen, Beth and Shapiro, Alan "The Use and Abuse of Greek Vases", in Clark, Andrew J. and Gaunt, Jasper with Gilman, Benedicte. Essays in Honour of Dietrich von Bothmer. Amsterdam, 2002. p.83-90. Neils, Jenifer and John H. Oakley, eds. Coming of Age in Ancient Greece: Images of Childhood from the Classical Past, exh. cat. (Hanover, NH: Hood Museum of Art, Dartmouth College), p. 261-62, no. 66. Spivey, Nigel and Squire, Michael. Panorama of the Classical World (Los Angeles: Getty Publications, 2004), p. 255, fig. 402. Paleothodoros, Dimitri. Epictetos, Collection D'Etudes Classiques. (Louvain, Namur, Paris and Dudley, MA: Editions Peeters/Societe Des Etudes Classiques, 2004), vol.18, p. 100. Schmidt, Stefan. Rhetorische Bilder aud attischen Vasen: Visuelle Kommunikation im 5. Jahrhundert v. Chr. (Berlin: Dietrich Reimer Verlag, 2005), p9.169-170, abb. 84, n. 48. J.C. McKeown. Grece, un cabinet de curiosities, Contes etranges et faits surprenants du berceau de la civilisation occidentale. (Paris: Editions Bibliomane, 2014), p. 269. Hunt, Peter. Ancient Greek and Roman Slavery (Hoboken, NJ: Wiley-Blackwell, 2018), p. 144, fig. 9.1.